JUMPIN’ JIM’S UKULELE MASTERS: LYLE RITZ SOLOS is a collection of 15 magnificent chord solos arranged for both GCEA and DGBE-tuned ukes by the ukulele jazz master, Lyle Ritz. A chord solo is an arrangement where the melody and harmony of the song is ingeniously captured in the many chord changes. These are some of the most challenging arrangements ever published for the ukulele, and unquestionably some of the most beautiful. Songs include Ritz favorites such as Lulu’s Back In Town, Bluesette, Don’t Get Around Much Anymore, Dream, Where Or When and 10 others. 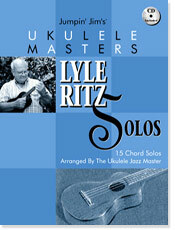 Also included is a CD of all 15 songs performed by Lyle Ritz himself as well as a feature on creating your own ukulele chord solos. Songs are arranged for both GCEA and DGBE tuned ukuleles.